On March 12, 2018 big sky flashes have been observed from Wellington, Ohio as a satellite high above the earth detected the same mysterious pulses! 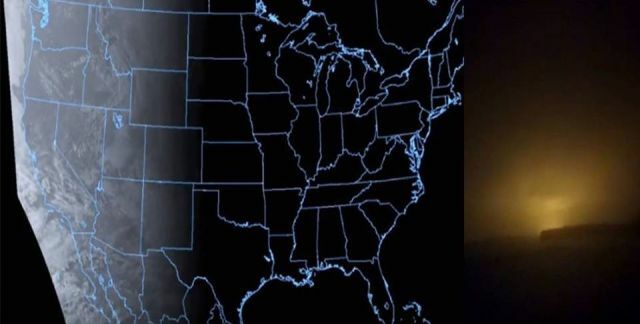 Many people around the world notice that something strange is going on in the sky. Night skies are much brighter and there is a strange glow from where the Sun has set. I definitely noticed a strong glow some nights long after the sun has set. Like the glow is different along the entire horizon. I can say the same for the night sky here in Opononi, Northland, New Zealand. I don't see the western ocean horizon, but there is a 'glow' to the west well after sunset. I saw that glow after the sun went down and it was dark, on a cruise in Feb going south to Puerto Vallarta. It might be some kind of energy being released from movement of the Earth’s core, maybe pole shift connected? Could the flashes of light be caused by the solar winds penetrating a weakened magnetic shield? According to Spaceweather, the vernal equinox is less than 10 days away. That means one thing: Cracks are opening in Earth's magnetic field. Researchers have long known that during weeks around equinoxes fissures form in Earth's magnetosphere. Solar wind can pour through the gaps. NASA and European spacecraft have been detecting these cracks for years. Small ones are about the size of California, and many are wider than the entire planet. 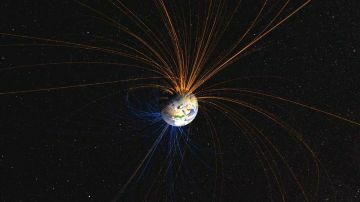 While the cracks are open, magnetic fields on Earth they are connected to those on the sun. While these cracks are no danger to people on Earth there is another strange phenomenon that threatens to flip Earth’s magnetic field. 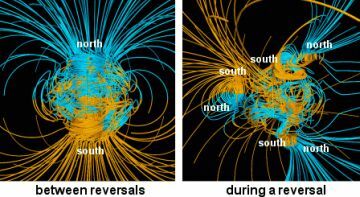 Earth’s magnetic field is decaying at such a rapid rate that scientists think the poles may flip. New research shows the most significant weakening is happening under Africa, in an area called the ‘South Atlantic Anomaly (SAA). The force field has weakened significantly in the past 160 years and scientists have suggested that it could be in the process of flipping. Effectively this means a switch in magnetic polarity and would see compasses point south instead of north. Actually this has happened several times in the history of the planet, occurring roughly every 200,000 to 300,000 years. Approximately 40,000 years ago, it attempted to switch before snapping back into place, reports RT. Scientists believe that the SAA is the most recent display of a recurring phenomenon in Earth’s core beneath Africa that then affects the entire globe. They are getting stronger evidence that there’s something unusual about the core-mantle boundary under Africa that could be having an important impact on the global magnetic field. About the strange glow in the night sky; once again a strange orange glow has been spotted in the night sky and this time in London, Ontario. Witness Apelles_ofKos states: On my way home from the Alice cooper concert in Windsor I seen this orange glow in the sky at 1am. March 12, 2018. I didn't think too much of it at first but I seen many reports of people seeing the same thing all over the world. Just curious about what this is because it wasn't a fire. Despite it is not clear whether it is a weak magnetic field, a strange anomaly under Africa or maybe there is another unknown source that causes all those strange glows and flashes in the sky, it seems to be going on. Actually Here In My Region Helderberg ,Western Cape South Africa ,exactly the same things are happening,when the sun sets here western horizon,theirs a heck of lot of electromagnetic interference around..